Network Fun!!! -- A Security/Network Engineer's Blog: Palo Alto: What is the Maximum Number of ARP Entries The PA-3020 Firewall can Handle? Palo Alto: What is the Maximum Number of ARP Entries The PA-3020 Firewall can Handle? I had to do a few things to get this going. 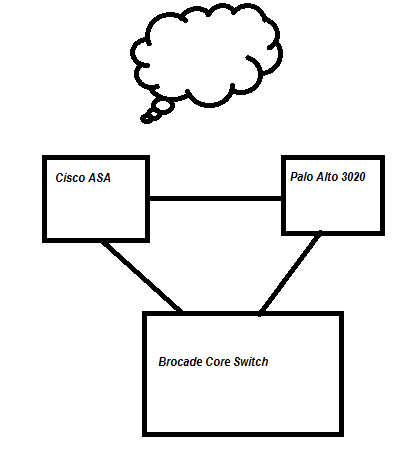 Create a vlan between the Palo Alto and the Brocade Core Switch. IP the wireless vlan to be the default gateway (that used to be the Palo Alto, now the Core Switch). Add a static route on the Palo Alto to point the wireless network to the Core Switch. And add a route-map on the Brocade Core Switch so that the wireless traffic wont take the default route, but the path of the Palo Alto. So, why did we change the topology? Because the Brocade Core Switch can handle a whole lot more ARP entries than the Palo Alto. Updated - With the release of 6.0, the 3020 can now support 3000 arp entries but you will need to issue an unlock command and restart the firewall for it to take effect. Very good. Thanks for the update.